It was surprising to see, in a news report in The Grocer on January 14, a quote describing infrared people counting technology as “outdated”. It was surprising because it is incorrect. On the contrary, many retailers have rejected video-based people counting in order to adopt infrared thermal technology. The Irisys thermal imaging-based solution is the most widely used detector for people counting and queue management in the world, with over 150,000 sensors deployed by retailers, banks and other businesses. The Irisys queue management solution has never been beaten in a competitive, head to head trial, including most recently against the video-based system mentioned in The Grocer article. queue management solutions that can provide accurate reporting on queue length and average wait times, as well as predict checkout requirements for optimal customer service. A number of key factors make it more effective than video-based solutions. First, the Irisys solutions are fully PCI (Payment Card Industry) compliant, in part because thermal imaging cannot either see or record the PINs being typed into chip and PIN machines. But video solutions have the ability to do this: very easily with high definition video and with a reasonable degree of accuracy using a low resolution camera. 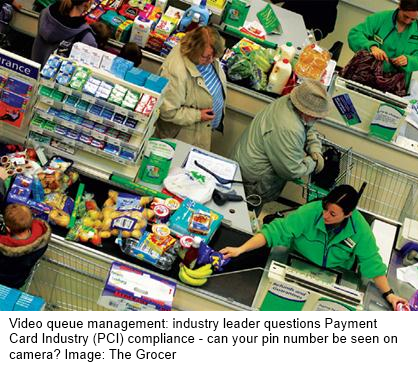 In 2011, following an independent review by SureCloud – a security consultant and approved PCI scanning vendor - they recommended that organisations using video-based people counting and queue management solutions should use an algorithim to blank out the area around a chip and PIN terminal. But this might not always be technically possible; and for such a system to achieve PCI compliance inspectors would need to be certain that blanking had been completed effectively and that it was irreversible. Regular reviews would then be needed to ensure this remained the case. And clearly, any company using mobile chip and PIN devices would find these processes particularly difficult. None of these issues would be encountered by a company using a thermal solution. At the same time, concerns about the way video cameras in public places can infringe personal privacy have been expressed in the UK and in many other different countries. Again, privacy is simply not an issue for a company using thermal technologies. In addition, tests show that thermal systems deliver more accurate results than video when recording the number of people entering a building through wider entrances, such as those commonly used in supermarkets, shopping malls and many other mainstream retail outlets. Thermal solutions are indifferent to changes in lighting conditions, unlike video, which can be adversely affected by bright lighting or dark shadows. Irisys queue management solutions also require much lower power consumption than video solutions, using 80% less electricity than video requires, so making thermal much more cost effective and a greener option. Proponents of video claim it produces more accurate measures of customer numbers by using height to distinguish adults from children. But this is a rather arbitrary and crude method, prone to inaccuracies through miscounting shorter adults, taller children, or people affected by a range of medical conditions and disabilities. A retailer seeking to optimise queue management by using this method to differentiate between individual shoppers and a family shopping unit is therefore making the cardinal error in terms of data analysis – starting the process with inaccurate data. A more effective approach is to accurately count everyone entering a store as a potential customer; and if the business requirement is that children should be discounted this should be done during the analysis of raw data. In terms of optimising queue management, Irisys uses thermal sensors deployed above checkout areas to feed data into sophisticated behavioural algorithms that can accurately tell the difference between a family or group of four people and four separate customers. Irisys pioneered the use of predictive queue management techniques in 2008, with Morrisons as its launch client in the UK. Tesco also use the technology, to count the number of people queuing at its tills and so keep its ‘one in front’ promise to customers about opening extra tills as soon as queues develop. Recent client wins for Irisys include a deal with a major US grocery chain. Over 4000 stores are now installed globally, serving over 100 million customer per week. The company’s client base has grown quickly because its technology is so accurate that retailers display wait times and checkout prediction data to customers at the entrance to the store and above the checkouts. Research shows that if customers know queues are short at busy times they are more likely to enter a store. Shorter queues have also been found to help increase basket size. Infrared, thermal sensor solutions offer increased accuracy in people counting, enabling optimised queue management, in an energy-efficient, cost-effective, non-intrusive, PCI-compliant way, with none of the privacy or security threats associated with a video solution. Outdated? No. Out in front.